Transport in humans is a process that takes place through two closely related systems: the circulatory system and the lymphatic system. 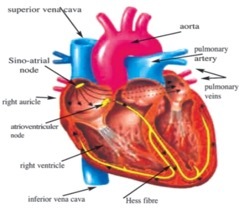 This consists of the heart and the blood vessels through which the blood passes. These vessels form a complete circuit (a closed circulatory system). 1. The 2 atria (auricles): these are the upper two chambers and have thin walls. They receive blood from the veins. 2.The 2 ventricles: these are the lower two chambers and have thick muscular walls. They pump blood through the arteries. The heart is divided longitudinally into two sides by means of muscular walls. Each atrium is connected to its own ventricle through an opening which is guarded by means of a valve. Each valve consists of thin flaps. In order for these flaps not to turn inside out, the free edges of these flaps are attached to the ventricle wall by means of tendons. Thus, blood is permitted to flow only from the atrium to the ventricle, not in the reverse direction. The right valve (the tricuspid valve) is made up of three flaps, while the left valve (the bicuspid valve or the mitral valve) is similar in structure and action, except it is formed of two flaps. There are also semi-lunar valves where the heart connects with the aorta and pulmonary arteries. The heart beats regularly throughout the whole life time. The outer layer: a coat of connective tissue. The middle layer: this is relatively thick and consists of involuntary muscles which contract and relax under the control of nerve fibers. The inner layer: the endothelium, which consists of one row of tiny epithelial cells followed by elastic fibers that give the artery elasticity. Arteries are usually buried among the body’s muscles. They carry oxygenated blood, except for the pulmonary artery which comes out of the right ventricle to the lungs and carries deoxygenated blood. There are less elastic fibers. The middle layer is less thick. Accordingly, the wall of the vein is thinner than that of the artery, and it doesn’t pulsate. Veins carry deoxygenated blood, except for the pulmonary veins that open in the left atrium and which carry oxygenated blood. A number of veins possess a system of internal valves along their length to prevent the backflow of blood, and allowing it to pass only in the direction of the heart. Sites of these valves can be observed in the arm veins. This research was done by William Harvey, an English doctor, who discovered the idea of blood circulation in the 17th Century. Capillaries are tiny, microscopic vessels which connect the arterioles with the venules. This fact was discovered by Malpighi, an Italian scientist, at the end of the 17th Century. Malpighi completed the previous work of Harvey. The average diameter of capillaries ranges between 7 -10 microns. Their walls are very thin and consist of one row of thin epithelial cells with tiny pores between them. The wall of the capillary is about 0.1 microns thick, which facilitates quick exchange of substances between the blood and the tissue cells. Capillaries spread in the spaces between cells all over the body’s tissues. Capillaries reach all the body’s cells and supply them with their requirements. If all capillaries in the human body were put end to end, their overall length would be about 80000 kilometers. Blood is a liquid tissue. It contains red blood cells, white blood cells, and blood platelets. The fluid part of this liquid tissue is the blood plasma. Blood is the principal medium in the process of transport. It is a viscous red liquid and weakly alkaline (pH 7.4). The human body contains 5-6 liters of blood on average. 1% inorganic salts as Ca++, Na+, and (HCO3). 7% proteins as albumin, globulin, and fibrinogen. Red blood cells are the most abundant blood cells in the body. There are about 4- 5 million cells/mm3 in males, and 4-4.5 million cells/mm3 in females. Each cell is destroyed after 120 days and circulates about 172000 times around the body. They are produced in the bone marrow of the backbone. They are round in shape, biconcave and enucleated. They contain hemoglobin (protein + iron), which gives the blood its red color. Inside the two lungs, the hemoglobin combines with oxygen to form pale red oxyhemoglobin that carriesoOxygen to different parts of the body, where it leaves oxygen and unites with carbon dioxide to form dark red carboxyhemoglobin. Venous blood is darker than the arterial blood. Red blood cells are destroyed in the liver, the spleen, and bone marrow. The proteins in the hemoglobin are used in the formation of bile. There are about 7000 cells/mm3 in the human body, but this number increases if the person has a disease. They are colorless and nucleated. They live for 13-20 days and are continuously formed in the bone marrow, spleen, and lymphatic system. 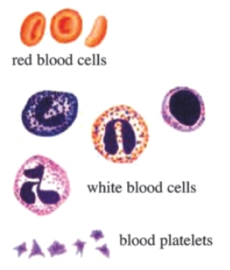 There are different types of leucocytes, each with a specific function. The main function of W.B.Cs is to protect the body against infectious diseases. They circulate continuously in the blood vessels, attack foreign particles, and destroy and engulf them. Some of them produce antibodies. These are very small in size (1/4 of R.B.Cs), enucleated, and live for about 10 days. They are about 250000/mm3 and are produced in the bone marrow. They play a role in blood clotting. To transport digested food substances, together with oxygen, carbon dioxide, waste nitrogenous compounds, hormones, and some active and inactive enzymes. To control the process of metabolism and keep the body temperature at 37 degrees C. In addition, it regulates the internal environment (homeostasis), such as osmotic potential. To protect the body against microbes and pathogenic organisms through immunity involving the lymphatic system. To protect the blood itself against bleeding by blood clotting. The lymphatic system is considered as the immune system of the body due to its defence ability and the production of antibodies. The lymphatic system consists of a large number of lymphatic capillaries. They take up blood fluid that comes out from the blood capillaries, called the lymph. The lymph contains nearly all of the plasma’s constituents and leucocytes. The lymphatic capillaries empty the lymph into the circulatory system along the superior vena cava. The lymph passes across the lymph nodes which are found at certain points along the lymph capillaries. Lymphocytes are packed into the spaces of lymph nodes and trap the microbes produced by white blood cells . The spleen is considered one of the most important lymphatic organs in the body.